G.A. Mangus completed his second season as an assistant coach at Kutztown University in 2018. He serves as the offensive coordinator, quarterbacks and tight ends coach and holds a wealth of successful experience at the Division I, II and III levels. In 2018, KU finished ranked #13 in the nation in Total Offense, #12 in Passing Offense, #6 in Red Zone Offense, and #19 in Scoring Offense with 38.0 points per game. Mangus took over the KU offense in 2017 and led KU to the fourth-best season in school history in total offense – 439.9 yards per game. KU scored 60 points twice in a season for the first time in school history, and ranked third in the PSAC at 37.5 points per game. Mangus has guided eleven All-PSAC selections, including KU's first All-PSAC tight end in a decade. KU finished 9-2 in 2018, finally losing to Hillsdale in the NCAA Division II playoffs. It was only Kutztown's third playoff appearance in the program's history and first since 2011. In 2017 the Golden Bears finished with a 8-3 record and closed the season with their first victory against Slippery Rock since 2012. Mangus directed a 2017 offense that ranked #13 in the Nation in Pass Efficiency, #25 in Scoring Offense and Passing Offense, and #32 in Total Offense. They also ranked #11 in the Nation in Time of Possession in 2017. Mangus, a former quarterback at the University of Florida, spent seven years at the University of South Carolina. He served as the offensive coordinator while also coaching the quarterbacks and tight ends. He played for Steve Spurrier with the Gators at Florida, and rejoined Spurrier as an assistant coach at South Carolina with the Gamecocks. 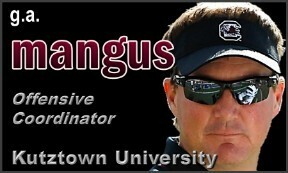 Mangus joined the South Carolina staff in 2009. He guided quarterbacks to numerous school records not only for yardage, touchdowns and completion percentage, but for career wins for a starting quarterback. In his final season in 2015, the Gamecocks scored nearly 33 points and gained more than 440 yards of offense per game. Mangus' abilities as a coach spill over into recruiting, as he was named one of the nation's top 25 recruiters by ESPN, Rivals.com and by 247Sports.com in February 2011, and one of the top 50 recruiters by 247Sports.com in 2012 and 2013. He is coming off a one-year stint at South Carolina State in 2016. Prior to South Carolina, he was the offensive coordinator and quarterbacks coach at Middle Tennessee State for three seasons under former Gamecock coach Rick Stockstill. Mangus was the predecessor to current KU head coach Jim Clements at Delaware Valley College. Mangus coached the Aggies for four years from 2002-05, as Clements took over following his departure in 2006. In his first year at Delaware Valley, Mangus went 2-8 in his first season, and turned the team into an NCAA Division III championship contender. In the next three seasons, Delaware Valley notched a 33-4 record, won three conference championships, and advanced to the national quarterfinals twice. In 2004 and 2005, Mangus led the Aggies to perfect back-to-back regular-season records and the team's first overall Middle Atlantic Conference championship. The 2005 squad also earned a MAC title and advanced to the NCAA playoffs. Mangus was named the league's 2003 and 2004 Coach of the Year and earned the East Region Coach of the Year Award from Don Hansen's Football Gazette in 2004. Mangus was voted the American Football Coaches Association (AFCA) Division III Region 2 Coach of the Year. His off-season was capped when he was named the Tri-State Coach of the Year by the Maxwell Football Club. Following his graduation in 1992, Mangus remained at Florida for three years, as a graduate assistant and assistant offensive line coach. The Gators won two SEC titles (1993 and '94), reached the championship game in 1992 and made three bowl appearances during that time. Mangus' first full-time position came at Widener. He began as the offensive line coach, moved into the running backs and quarterbacks coach, and was eventually elevated to offensive coordinator. The Pioneers had two eight-win seasons and made two postseason appearances, including a spot in the 1995 Division III playoffs. Mangus became the assistant head coach and offensive coordinator for Ursinus College in June 1999 and joined a program that had gone 3-7 in 1998. The 1999 squad posted a school-record 10 wins, including its first-ever Division III playoff win. The Bears went 8-2 the following year for their first back-to-back winning seasons since 1954. He and his wife, Lauren, have two daughters - Grace (13) and Hope (10). Received his bachelor's degree in economics from Florida in 1992. Born December 4, 1968, G.A. and his wife, Lauren, have daughters Grace and Hope.